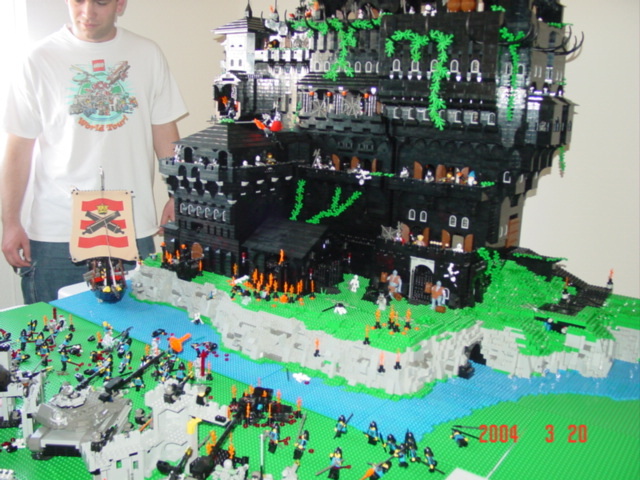 Classic-Castle.com • View topic - The Battles Contest is under way! The Battles Contest is under way! 1. Build a medieval battle scene. 2. You may use official factions, as well any custom factions of your choice. 3. Custom pieces of any kind are more than welcome. 4. You may use a small number of figs or entire legions, the choice is yours. 5. You may use beasts and/or mythical creatures. 6. You may use clone bricks, though I don't encourage such things. 7. Medieval style weapons only, please. Enter as often as you wish! Realistic Action (4 points): Does it look like the combatants are actually fighting? Does the whole scene look fluid and mobile or does it look stiff and staged? Site of Battle (4 points): Is the site believable? Does the action fit with the features of the site? Is anything going on that just doesn't fit the terrain? Creativity (2 points): Is there something here I have never seen done before? Is there something that stands out as being really unique? These are the questions I will be asking myself as I am grading the entries. It may seem strange to some of you that creativity is scored so low. That is on purpose. I want the main emphasis to be on the battle and the terrain the battle is being waged upon. I will give points for unique ideas, but I don't want them to overshadow the brawl. The contest will end on April 5 at midnight. That gives all of you over a month to plan, build, and post (its also my birthday ). And if you don't have all the pieces you need to make the ultimate battle, try anyway. You might surprise yourself. I have a number of doubles that I have been meaning to use in a contest at some point. This seems like as good as time as any. First prize will be a copy of 6042 Dungeon Hunters (opened with box). Second prize will be 1547 Black Knight's Boat (opened with box). And third place will 6037 Witch's Windship (no box). I know, I know, the windship is the one of the worst sets ever and is like no prize at all. Post links to entries here as well as any questions. 1. You may use something you have already built but it can't have been submitted in any other contest. 2. No Photoshoped pics. You may touch up the pictures but no adding figs, elements, blood, drawing in weapons, etc. 3. Ldraw entries are allowed as long as you don't abuse it. No impossible uses of pieces, no overabundant use of hard to find parts, etc. 4. Pics should be less than 800x600 pixels. Last edited by JoshWedin on Sun Feb 27, 2005 3:57 am, edited 4 times in total. And third place will 6037 Witch's Windship (no box). I know, I know, the windship is the one of the worst sets ever and is like no prize at all. I know, and we don't even get the box! That's the best part of the set! Thanks! No it doesn't have to be new. But it can't have been submitted to any other contest. Athos wrote: I know, and we don't even get the box! That's the best part of the set! Why do you think the box isn't included in the prize? This sounds like a fun contest. Does the not being allowed to use photoshop also mean you can't put in fire or flames? Well, I guess not but I might as well ask. Well well, I will try my chance in this contest. Now let's get some scissors and ... Ah nevermind.What about the pictures? How many should there be? And where will we put our entries?Are you going to make a web-page about it or what? I have an idea, I think I'll try to enter. However, I believe you should add a size and count restriction on submitted images. well, this is a pretty large battle. Problem is ... those dang spacers figured out how to come back in time and just went gonzo on the poor falcons. And just one teaser Pic! I'm not sure if that is acceptable. One of the factions is non-castle, but Josh would bring light up on this subject. Wow! I just got home from work and I am besieged by posts! I will try to answer all your questions now. swordfish wrote: This sounds like a fun contest. Does the not being allowed to use photoshop also mean you can't put in fire or flames? Nope, no drawn in flames. There are lego flames and I am only allowing photo editing for touch up purposes only. I won't be hosting pics. Use your choice of pic hosting and post a link in this thread. I will be keeping a list of entries and will probably make up a quickie page with my MOCpages account. I will post the link to that here later on. Pics should be kept to 800 x 600 pixels and lets limit them to ten pics per entry. I don't mind looking at a bunch of pics per entry but I don't really want to see in progress pics or plans. I only want to see finished product. In regards to Dave's entry. Dave, your battle scene is impressive. The castle is huge and the landscaping around it is very nice. However, I can't allow it. The battles need to use medieval weaponry only. Sorry. It is, after all, a battle contest on a lego castle website. I will edit the rules to make this more clear. Thanks for all the interest and I hope this clears up some of the confusion. PS. Hey Yeti, good luck getting the windship. So, it's finally going again, is it? Great! I really want to enter, but doubt I'll have the time, we'll see. By the way Dave, thanks for the contest! You might also just want to say something about reserving the right to revise the rules at any time, just in case there's a trouble-maker out there.